Zambia can be an inspirational example for a region in democratic distress. But the opposite is also true. Will the EU help? 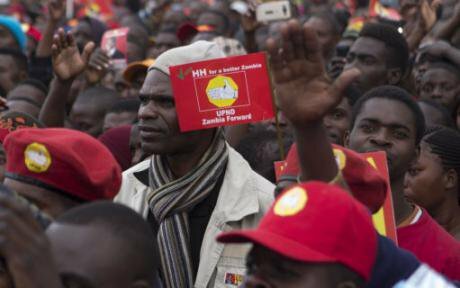 Supporters of the United Party for National Development opposition party attend election rally in Lusaka, Zambia, Wednesday, Aug. 10, 2016 amid concerns about political violence. Moses Mwape / Press Association. All rights reserved.Zambians went to the polls on August 11 in presidential and parliamentary elections in what is expected to be a tight race between President Edgar Lungu's governing PF party and the opposition UPND led by Hakainde Hichilema. The EU on the ground, along with other international observers, can exert a positive influence in what has been a tense and sometimes violent campaign. In its new Global Strategy for Foreign and Security Policy the EU commits to supporting democracies where they emerge, for “their success […] would reverberate across their respective regions” – Zambia presents an opportunity for the EU to show it still has serious clout as a foreign policy actor. Zambia is experiencing its deepest economic crisis for a decade as copper prices, the main export of the country, continue to drop. Its currency, the kwacha, ranks amongst the world’s worst performing and its foreign debt has more than doubled. Chronic electricity shortages and a severe drought have further exacerbated the structural issues that the growth of previous decades failed to address: widespread rural poverty, high unemployment, and extreme wealth inequality. In the political arena too, dividing lines have deepened. In the 2015 by-election, the ruling Patriotic Front’s (PF) Edgar Lungu took over after President Sata’s death, winning with a narrow margin over opposition candidate Hakainde Hichilema of the United Party for National Development (UPND). In today’s elections the two rivals face off again. It has become clear that the incumbent Lungu will not give up power without a fierce fight. In May an unverified PF action plan was leaked. It outlines in remarkable detail the governing party’s strategy to rig the elections, restrict opposition space, and curb basic civil and political freedoms. The government denies the authenticity of the document, but it appears to have been followed to a tee. The list of tactics is long, but perhaps most illustrative of the abuse of state powers is the shutting down of The Post, one of Zambia’s last independent news sources, over allegedly unpaid taxes. Despite inviting the EU and others international actors to observe the vote, Lungu’s disregard for the electoral process is evident. In his campaign he openly stated he did not care about international election observers and vowed to “sort out” opposition supporters if they disputed the election results. Zambian police and security force involvement in increasing incidences of political violence suggests that Lungu is preparing to use them to quell any unrest over a disputed outcome. He has also staffed the recently established Constitutional Court – a crucial organ in case of electoral disputes – with judges close to him or to his party. None of them meets the constitutional requirements for the post. Foreign donors must pay attention to this rapid relapse of the rule of law – and the EU should lead them. The EU, together with its member states, is Zambia’s biggest donor of foreign aid, a major trade partner, and maintains regular political dialogue with Zambian authorities. More than a fifth of its total aid budget of €484 million until 2020 is dedicated to improving democratic governance and accountability in the country. An additional €7 million is devoted to strengthening electoral processes in recipient countries. This includes technical and financial assistance to the Electoral Commission of Zambia (ECZ), support to civil society organizations and media in election monitoring and voter education, and coordination between the ECZ and the Zambian police. The EU should use this influence over the Zambian government to ensure a peaceful and credible electoral process. In its preliminary findings the EU Election Observation Mission (EOM) has a responsibility to call out violations and irregularities in the run-up to elections and on voting day itself. READ MORE: Why does the west turn a blind eye to Rwanda's dictatorship? The Zambia Elections Information Centre, a platform bringing together civil society, faith groups, and other concerned parties, as well as other groups monitoring the elections, constitutes a crucial resource to guarantee an informed and balanced judgement. In the case of a contested outcome, the EU must restate its position on zero-tolerance for electoral violence and provide support for domestic peaceful dispute resolution mechanisms. The EU can play a decisive role by using its significant diplomatic influence, for instance through public statements calling for peaceful mediation and dialogue, but also by stepping up its investment to enhance the capacity of national and district conflict management committees. Stressing the obligation of security actors to keep a professional and non-partisan posture will also help deter the use of security forces as a political tool. In case of gross electoral fraud and malpractice, and only if all other diplomatic demarches have been exhausted, it should consider targeted restrictive measures. Zambia does not have the political or economic clout of a Kenya, Nigeria or South Africa. But it does boast a record of 25 years of peaceful democratic consolidation. Zambia can be an inspirational example for a region in democratic distress. But the opposite is also true. The EU may be able to tip the balance in the right direction.